The lives of emergency crews could have been put in danger if last month's exercise to test the response to a terrorist attack in London had been real, it has been claimed. 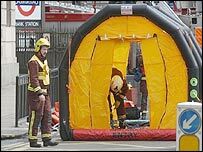 The exercise in September centred around Bank tube station on the London Underground and involved fire, ambulance, police and medical staff. But the Fire Brigades' Union (FBU) has claimed it was too unrealistic and it has serious concerns about mistakes that were made. The Minister for Civil Resilience, Nick Raynsford, is to receive a report on the drill in December. Dozens of police cadets acted as passengers in a Tube train that was stopped 50 yards short of the platform after the driver reported a chemical attack. New equipment worth millions of pounds, including chemical suits, was tested in the exercise. Five hundred emergency services staff cordoned off the streets, rescued the passengers, decontaminated them and took them to University College Hospital. But the FBU says rescue crews were sent underground too quickly - before the threat had been assessed properly. It says a similar mistake led to the deaths of the first fire crews responding to the sarin gas attack on the Tokyo subway in 1995. The union also claims the decontamination tents may have been put in the wrong place because not enough attention was paid to the wind direction. And it says one of the showers used to decontaminate firefighters was not working properly. Linda Smith of the FBU told BBC London that the mock-up had been in very controlled conditions. "The cadets used as victims had been fully briefed and of course ordinary members of the public wouldn't have known what was going on, " she said. "It was done on a Sunday, the area was cordoned off, there were no members of the public allowed even on the footpaths around the area. "So I don't think you could say if there was a dirty bomb on a tube train, it would go as smoothly as that - anyone with any common sense would tell you in reality it would be different." London mayor Ken Livingstone told BBC London the exercise did have value. "This was the first time we tested new equipment," he said. "You have tests like this to show up the flaws in your procedures and this is what the object of the whole thing was." Mr Raynsford has said there would always be lessons to be learned from such an exercise. "It was a simulated chemical attack on a Tube train and it was meant to reassure the public." What is behind the air alerts? Do we need new anti-terror laws?